Not much happens in on the 1934 island of Inishmaan on the West Coast of Ireland. The inhabitants pay for juicy bits of news and gossip from JohnnyPateenMike (Dermot Crowley). A goose might be missing, a sheep born without ears, or on a good day, a guy with a funny-looking moustache who has come into prominence in Germany. Johnny uses any money he gets his hand son to buy liquor -- for his alcoholic mother, Mammy O'Dougal (Nancy E. Carroll), whom he hopes will soon die of the drink. And he has no problem telling her that as he and the bed-ridden woman trade unbelievably hurtful insults. One day, Johnny has big news: a Hollywood company has come to island to film and might offer a way off the island to anyone who gets cast in the move, "Man of Aran." Slippy Helen (Clare Dunne), who is rough and cruel, but who fancies herself the prettiest and most desirable woman on the island, devises a scheme for Babby Bobby (Liam Carney) to take her and her brother, Bartley (Laurence Kinlan), over to the film location in his boat. 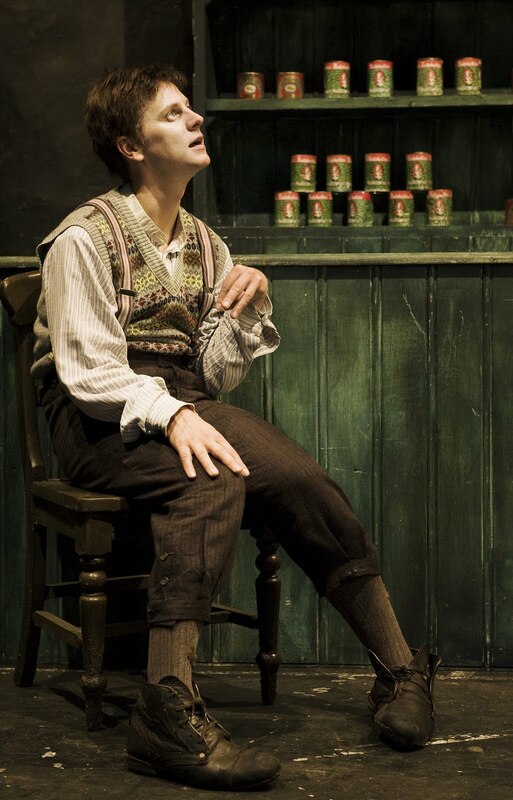 The chance to make something of his life appeals also to Billy Claven (Tadhg Murphy), known as Cripple Billy, born with a deformed arm and foot and considered totally pitiful and undesirable as a man by everyone, especially sadistic Helen, who captures the boy's heart. BabbyBobby's fears a cripple will bring bad luck aboard the boat., but yields when Billy produces a letter from his doctor (Paul Vincent O'Connor) indicating that this might be the unfortunate man's last chance at happiness. Billy's decision to leave doesn't go over well with Eileen (Dearbhla Molloy) and Kate (Ingrid Craigie), the two women who adopted him when when his parents died shortly after his birth and who spend most of their time worrying about him when he is a few minutes late returning to their general goods store. Kate worries so, she's been known to talk to stones. McDonagh (Pillowman; A Behanding in Spokane; The Lietenant of InishoreThe Neauty Queen of Leenane) is an acquired taste, but once you allow yourself to enjoy the dark humor, you're swept into a world of rich characters and skilled storytelling. All of the performances are strong with each character standing out as unique -- a tip of the hat to the fine direction by Hynes. The second act is disjointed and doesn't flow like the first. Two hours and 40 minutes feels like it. The Irish accents can be very thick and hard to understand at times. In fact, the comment I heard most often as the audience exited was that they had missed a lot of the lines. Too bad, because some of them are painfully funny. The Cripple of Inishmaan plays at the University Theatre, 222 York St., New Haven Friday, June 17 at 8 pm; Saturday, June 18, at 3 and 8 pm; Sunday, June 19 at 3 pm as part of the International Festival of Arts & Ideas, which runs through June 25. Tickets are available at http://www.artidea.org/ or by caling 203-562-5666 or 888-736-2663 or by going to the Shubert Theater box office at 247 College St. Click here for a complete listing of events and activities. This production by the Druid and Atlantic theater companies concludes a US tour which began in February.